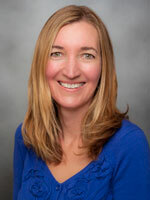 Monique Hedderson, PhD, is a research scientist at the Kaiser Permanente Northern California Division of Research. She received her Master's in public health from the University of Washington in 2000 and her PhD in epidemiology from the University of Washington in 2005. Dr. Hedderson’s research interests lie principally, but not exclusively, in the field of maternal and child health. Her research portfolio investigates the influence of preconception, prenatal and early childhood exposures on maternal and child health. Specifically, she has sought to understand how potentially modifiable factors before and during early pregnancy contribute to the risk of metabolic complications in women during pregnancy and postpartum, as well as their children. Dr. Hedderson has a long-standing interest in developing innovative targeted prevention and treatment strategies for high risk populations, especially interventions among reproductive aged women that can be implemented into clinical practice. She is also interested in the pharmacogenetics of glycemic response to metformin among patients with type 2 diabetes. This area of research has the potential to inform data-driven prescribing and precision medicine for antidiabetic drug therapy. A cohort study of Kaiser Permanente Northern California patients with moderate-to-severe atopic dermatitis (AD) will be used to estimate baseline characteristics and background incidence rates of safety events. Data from this study will provide valuable information regarding the current incidence rates of adverse outcomes among patients with AD. Safety events of interest include: viral reactivation, malignancies, lymphoproliferative disorders, thrombocytopenia, major/minor bleeding events, major adverse cardiovascular events, alterations in lipid profiles, and thromboembolism. To determine whether a mobile-health (m-health) tool (accessible via smartphone or website) intervention for obese pregnant improves patient satisfaction with their gestational weight gain, quality of life, stress and depression during pregnancy. Provider satisfaction with discussing gestational weight gain among their patients who used the m-health tool will also be assessed. We aim to compare the effectiveness and safety of glyburide and insulin at improving neonatal and maternal outcomes among women with gestational diabetes mellitus (GDM) requiring medication therapy in Kaiser Permanente Northern California from 2007 to 2016. We will use a cohort study design including women with GDM diagnosed from 2007 to 2016 where treatment groups contrasted are defined by therapy regimens (i.e., insulin versus glyburide or early versus late initiation of glyburide). This project will overcome shortcomings of past studies conducted in this area by using modern statistical methods that allow us to take advantage of variation in treatment patterns after the implementation of the universal Perinatal Center referral policy in 2007. More specifically, our approach consists of a cohort study with time-varying exposure to insulin and glyburide during pregnancy. This study will estimate the incidence of pulmonary hypothyroid in a pediatric population of children under age 4, based on data from the US-based Kaiser Permanente Northern California database, who were exposed to iodinated contrast agent through having a diagnostic procedure. This study will examine pregravid biomarkers of metabolic risk (adiponectin, high molecular weight adiponectin, c-reactive protein, liver enzymes, fetuin-A and LDL particle size) in relation to risk of gestational diabetes mellitus among women who participated in the Kaiser Permanente Northern California (KPNC) multiphasic health check-up (1985-1996) and had a subsequent pregnancy in KPNC. In this collaboration with GlaxoSmithKline, University of California San Francisco and Kaiser Permanente Northern California, we propose to perform a genome-wide association study in 1,000 patients of European ancestry with extreme response phenotypes to metformin using genomewide array and human exome chip, which include rare nonsynonymous variants. Our aim is to determine whether rare variants, either acting alone or in combination, explain much of the variation in response to metformin, particularly in the extreme responder and non-responder groups. Invest Radiol. 2018 Dec 17. PLoS ONE. 2018;13(7):e0199932. Epub 2018-07-03. Author(s): Rotroff DM; Hedderson MM; MetGen Investigators and the ACCORD/ACCORDion Investigators; et al. PLoS ONE. 2016;11(7):e0159500. Epub 2016-07-21. Clin Pharmacol Ther. 2014 Sep;96(3):370-9. Epub 2014-05-22. Am J Obstet Gynecol. 2012 Jul;207(1):68.e1-9. Epub 2012 May 23. Cancer Causes Control. 2003 Sep;14(7):619-26. J Am Diet Assoc. 2003 Mar;103(3):323-8.